I have written about fragrances a few times on my little blog and also about finding the perfect fragrance because until last year, I never really used to wear scents! However that all changed when I found my beloved Jo Malone scent. 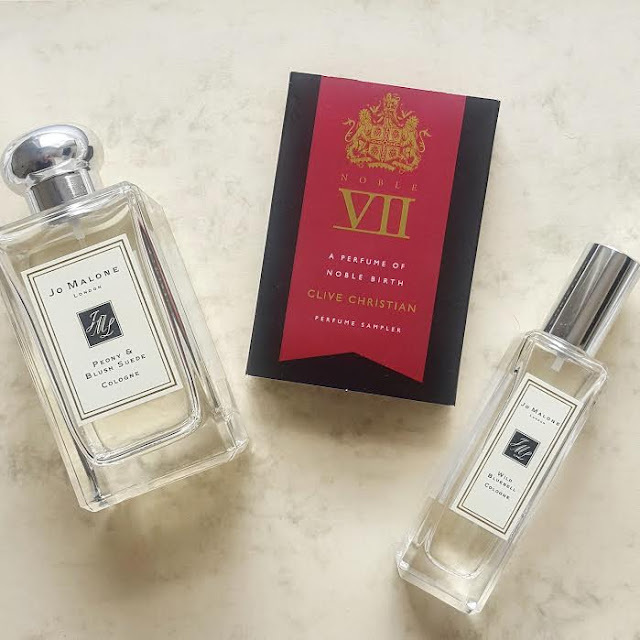 I wanted to talk today about the unique scents out there from Miller Harris with their zesty fragrances to Clive Christian gourmand perfume to Jo Malone with their luxurious range. There are so many scents out there that you can't find on the high street and I think that's a big selling point as it also adds a little dash of mystery when people ask what you're wearing. Obviously Jo Malone is one of my FAVE brands and the Peony Blush Suede will always be my scent regardless of how cliche it is but the main reason I love it because because the scent combinations are different. It has that floral hit but it mellows and deepens the longer it's on me which really lingers until bedtime! I do also adore the Jo Malone shops as well, I run right in and literally give everything a spritz which makes it easier to find that unique scent. I would also suggest spraying it on yourself because some fragrances do smell a little different when they are actually on you! Another way to try unique fragrances is to buy travel sets, let's face it, buying fragrances can be really damn expensive but if you look for those little travel sets not only do you get a few handy sized fragrances but you get to try a few different scents that you probably wouldn't have thought to try before! Most travel sets have about 3 different fragrances but the wonderful thing is they all have similar notes whilst being different, so if you like one of fragrances the chances are you may also like the others. I really love the way this brand layers scents together, it's something more than just "floral". If you wanted to go super luxury there are some very expensive but utterly divine fragrances from Clive Christian, I was kindly sent a couple of samples and Cosmos Flower is just so beautiful but way out of my price range but if you have the budget and want something truly unique, you could check them out! The best way to find your perfect unique scent is by giving everything a try, keep searching and keep looking for something new.